The series of Munich Guide articles started in 2010; the time I could not speak German fluently. However, I was (am still) fearless and willful requesting interview with people or stores that were (are) interesting. The memory reminds me of the old period, felt nervous about asking interviews, discovered Munich with heavy gears; further, it wakes up my adventurous inner soul. The experiences have developed my ability and skills of interviewing. Besides, it helps me to have more opportunities for my work now. Before, I edited Munich Guide articles with pictures and text as contents. It is great for readers who are interested to read and imagine the personalities of respondents and space; even for travelers who are ready to discover Munich. However, I thought it could have fun to offer videos to introduce about this city. Although you are not able to visit Munich soon, through the videos, you can take a closer view of it. 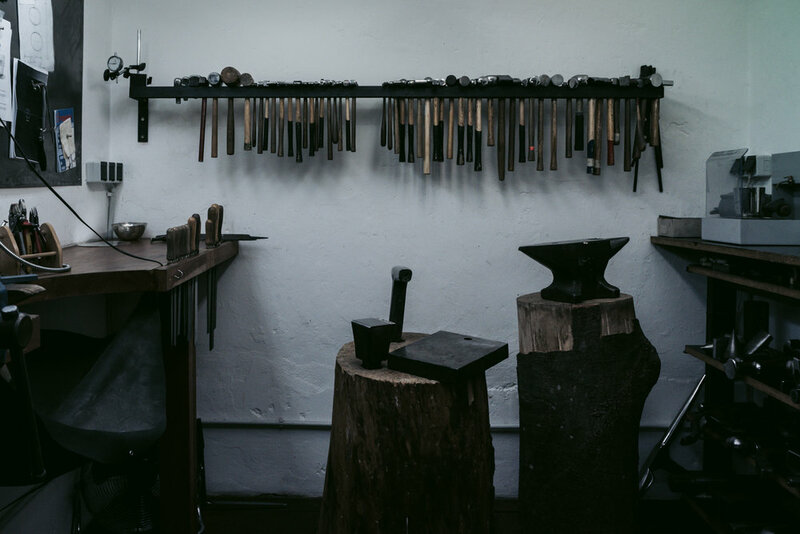 For the new concept of Munich guide, we visited the silversmith and goldsmith design atelier, Werkstatt:München where is near to the subway line U2, the station of Fraunhoferstraße. 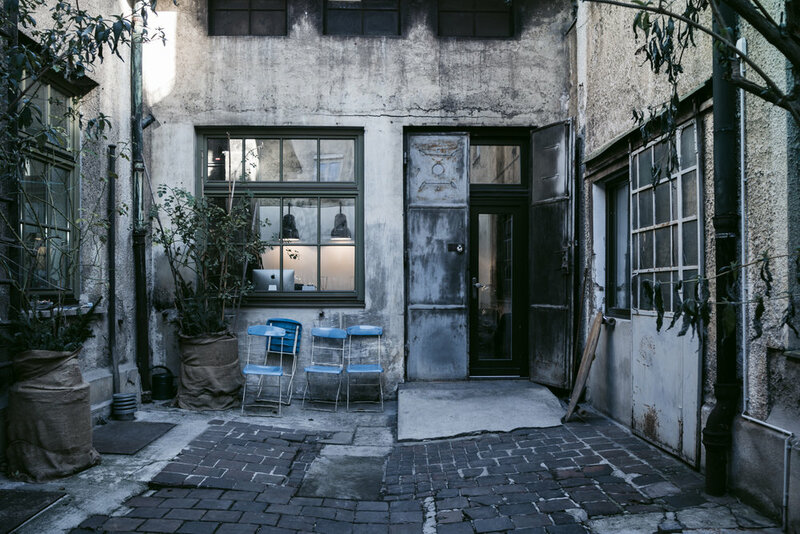 We talked to the owner, Mr. Klaus Lohmeyer and visited how the studio works. Please watch the video firstly to feel the atmosphere and then back to the article to read the story. Mr. Klaus Lohmeyer, the owner and creative designer of Werkstatt:München. He welcomed us sincerely with his warm hands. Matching to his career and taste, he wore a cap and scarf that are designed and made by his studio; the total look was in different layers of gray. Born in Munich, and he decided to stay in his hometown when he founded his atelier twenty years ago due to the lifestyle and quality here. Moreover, he extends and develops his vision into a wider range. Although I offered my interview questions to him before we met, facing to my questions, he chewed the issues in his mind firstly and then answered me thoughtfully. His personality is as firm yet full of emotion as his creation and collection; a fine and smooth thread of thought exists behind his masculine appearance. The most part Klaus enjoys from the creation is the inner silence and peaceful of the whole process; as a Taurus, Klaus has his emotional and sensitive roles. The process of bringing an idea to a real design piece through handcrafted creation means everything to him. It is not only about to create nice-looking accessories in different sizes but also to consider how every part matches the hands or body that is into our lifestyle completely. The studio makes every single component. Not only the silver and gold accessories are manufactured from the raw materials; to keep the collection as an independent line, they produce their metal fastening pieces. If they purchase some pieces from other suppliers, they are not able to design a unique collection at all. This is how a luxury brand exists that stands behind a strong concept and do not only focus on the price. Werkstatt:München knows well about every material they use. Therefore, they present the products in a proper and high-quality way. They design unique pieces; also, they accept special customer orders thoughtfully. There is always a concept and story behind a piece; still, it is all basic on the state of the material, the features and the weight, every little point effects the layout and cut. Keep a high quality is the only reason why they only accept limited customer orders. For better quality, Klaus loves to share his knowledge with the people who work in the studio; to develop all technique for better creations. When every single detail connects properly, then the impression of the label is found.